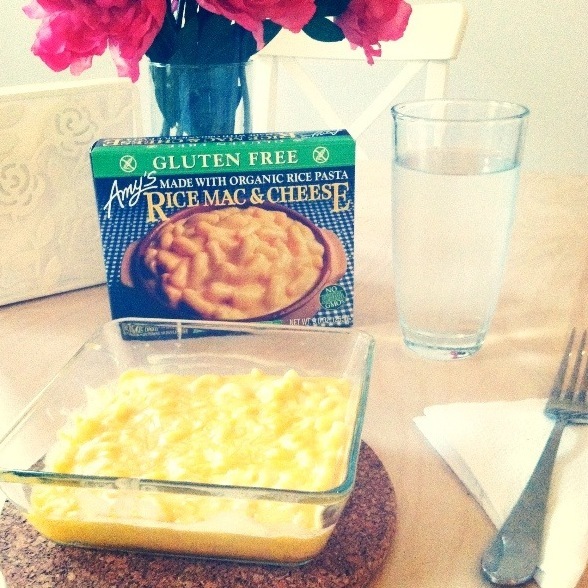 All hail the cheesy, gluten-free goodness that is Amy’s Rice Mac & Cheese! This is, without a doubt, one of my favorite dishes in the frozen food isle. It’s gluten-free, certified kosher, includes 0g trans fat, and is free of MSG and preservatives. Did I mention it’s also absolutely delicious?! The noodles are made of organic rice, and the sauce is about as home-made as you can get (without actually home-making it, of course). Just check out the nutritional information below, it’s pretty bare bones. If you are craving some soul food, but don’t want the fuss or clean up, this is it. Enjoy! Ingredients : 0g Trans Fat/No Added MSG/No Preservatives Organic rice macaroni (organic rice flour, water), organic lowfat milk, Cheddar cheese (pasteurized milk, culture, salt, enzymes [without animal enzymes or rennet]), grade AA butter (cream, salt, annatto), organic sweet rice flour, sea salt, annatto. Contains milk.